Every week, on Thursday night for the Kung Fu master who has so much to do at home, I limit my teaching to only three nights/week. The more I give out, students don’t come so what’s the point, and that’s why I limit my teaching for only three nights/week. It works out nicely because then I have two weekends for myself every week. The more I work, the Taoist God might get mad at me, and that’s enough information to give out to American students. Just kidding! Taking advantage of the beautiful weather this evening, changing like the I-Ching from cool to hot that inspired me to give out some secret teaching, and also in consideration of the Jewish celebration Rosh Hashanah. We have quite a few Jewish students here and I think that the Chinese and the Jewish are not all that different. We have a similar lunar calendar and a lot of our holidays coincide, additionally the culture is very conservative just like Chinese. When talking about the changing of weather, it makes me think of the changing of the cursive into the linear form. I decided to take out some of the broken pieces and fragments of the long animal form in order to explain and show our students some of the applications, and also the similarities of the Chinese form to calligraphy within a limited space such as a small space on the mat. For example, if an opponent, or five or ten opponents attack you in the corner, you don’t have room to get out. If on the street you may have a lot of space, but if somebody breaks into your house while you’re in the shower you are caught in the corner. So, I brought out what I call the condensed form. But, just talking about the art is not practical, and each form has to have the practical side. The fighting form is different than the work out form because you don’t have to finish the whole animal form, but you can extract the broken pieces. The fragments of the form are like the alphabet, and the entire form is like a sentence made up of the letters. This is why martial art is called body language, and the language itself has a logic and set of grammar that goes along with it. For example, certain breathing can be represented by commas and pausing. Instead of calling “Kia!” like karate, we use the internal expression, not acting, but from the truth, showing the expression, like an actor expressing emotion, it could be happiness or anger. Martial artists are the same, they express their feeling through the form whether fighting or training form. Kata is the foundation of any fighting form. We can also call it Taolu, and Vietnamese call it quyền pháp (Chinese call Chuan Fa). Kata is the combination of hand and body movement, structured for combat movement. You can practice on your own, which helps you memorize the movement without partners. From solo form practice, we pair with a partner and call it form sparring. Form sparring is a controlled sparring set using the martial practical moves. When faced with a real situation, those practiced moves become real-time combat reactions. It’s similar to learning to shoot na arrow at a target, so when it’s time to shoot at a real enemy, the movement is already rooted in you and there is no thought process involved. Another example is dance, as soon as the music comes on depending on the music you can dance to any style. 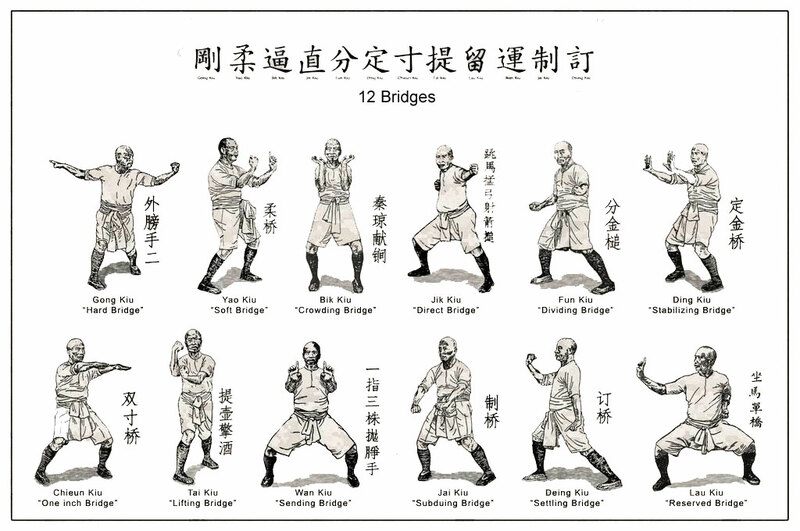 Chinese or Vietnamese Kung Fu all have an underlying, hidden structure in an abstract space surrounding the practitioner. To illustrate this, I taught the form in one mat square, and also in a 2×2 limited space. This allows my students to become acquainted to what it feels like when fighting close-range or in a corner. For instance, any fruit in nature has layers to protect it. The tree has bark, the fruit has skin, humans have skin, the car has a metal body. What I am teaching my students builds the layers of martial elements around them, enhancing their body language. The structure is abstract, but they are layers of protection from years of discipline and practice. Those layers of martial art surrounding them, in Vietnamese, we call them martial (võ) skin (vỏ). It doesn’t matter but the Vietnamese language shows that it is viewed as a layer of protection, or like a concrete layer surrounding you. The purpose of today’s teaching is to help students understand the layers surrounding them by abstracting the idea of Kung Fu into the grid of Chinese calligraphy. Just like a turtle surrounded by the shell. When you look at the form, it looks like you have empty hands, but in reality, when the Kung Fu form comes out to protect you, it is very concrete, though the idea is very abstract. For instance, when you write Chinese calligraphy as a beginner, you need the practice sheet to show you 4-8 directions, like a Ba Gua, to confine your stroke in an orderly form. The same concept is true with Chinese animal Kung Fu movement, which is based on this kind of structure which is composed from the Wu Tao, or the spirit dance ritual of the old days. I believe that if Japanese has a relation to Fujian and Shaolin White Crane (Thiếu Lâm Bạch Hạt), then they must have the same diagram like the Chinese Kung Fu animal form. I have also seen a lot of people fighting very sloppy. For us, form is the foundation for fighting and the foundation for sparring but it is important not to hurt people. A good fighter must have a good form, this has always been my slogan and my strategy. Just like a good painter knows how to make good strokes and have a good composition with good color perception, a martial artist must bring all of those principles and adapt them into the art. In order to appreciate the beauty of the form, which must have strength, power, and precision as a base foundation, and with that blueprint, we will develop good fighting precision. The Southern Chinese masters move with linear hands, but when they’re influenced by the Hindu master, te movement is very cursive like the Apsara dance. Totally based on the dance movement anyway, but depending on how you express into either the fighting expression or the dance expression. The same dance can be happy or sad, or a cat playing can also use the movements for killing. Whether for dancing or fighting strategy, we can use the movement either way. I am not joking when I say, if you miss one day you miss a whole system! Maybe, next summer when the weather is nice like this again, I will give this teaching out again. So, my special class shows that I respect the Jewish new year because I am alien to them, but if I teach too much on the Chinese New Year the Gods might get mad at me. Just like Jewish people don’t go to work on weekends.